I love to fold origami, and I have an interest in children and creativity. These two aspects were the focus of an origami workshop for children aged 5-10, held during spring of 2016. For this occasion, my colleague Stella De Muro and I decided to present only origami models that were designed by children, such as a beautiful photo frame or an ingenious tank. The last activity of the workshop that day was to create new origami models. Yuri had designed another photo frame. I suggested that he add a few folds to his photo frame that resulted in a chick. Later, I drew the chick’s eyes. Finally, Francesca suggested our chick was very similar to a famous mobile game character and that was its final name. Luca Congia was born in Sardinia, Italy. Currently, Luca works in the educational services of the southern Sardinia with children and adolescence. 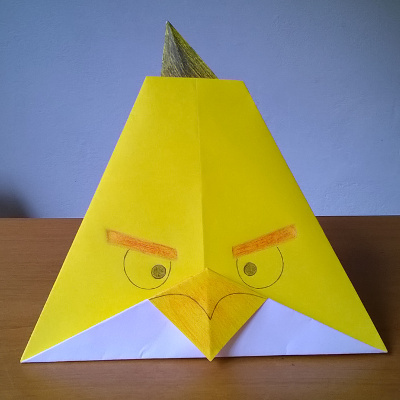 In 2016 he presented his educational origami-brick “Mattoncino-Prisma” to improve visuospatial ability, executive functions, planning skills and creativity in children. His other interests are drawing, music and creative activities for children. Yuri Murgia is a very creative boy who loves Harry Potter, breakdance, craft activities and, of course, origami. This origami model is his second creation.